This icy picture of Raymond’s Gut was taken on February 1, 2014. 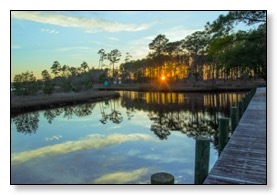 Our home on the gut is just three miles up the White Oak River from Swansboro, North Carolina. The first picture in this post can be seen in a larger version by clicking on it. That will take you to Pinterest. Once you are on my Pinterest board if you click one more time, you will get to see the original full-size image, and you can easily share the image. My Pinterest boards have lots of other area photos. The icy gut picture also happens to be one of the images that you can download for free at this site in a high resolution version suitable for printing. Please enjoy it but remember it is for non-commercial use. The winter of 2013-14 has not been a particularly nice one on the East coast. Even those of us along the Crystal Coast of North Carolina have not escaped the cold and damp of this seemingly endless winter. The weather was not too bad through the middle of December but it was not as nice as some Decembers. It got much colder in January. In fact we were not very far into January when we started hearing about the coldest winter in decades. Then there was the polar vortex which apparently lost its Canadian anchor and wandered down into the United States and tried to freeze us all. We were fortunate on the coast to get an early winter warmup or a January thaw as we used to call them in Canada. I think most of the east coast missed that brief respite from the cold. By the third week in January, we had a frozen gut in our back yard once again. On January 30 we awoke to a driveway covered in sleet and almost indistinguishable from our yard. It was the next day at 11AM before we got some melting on the driveway. Usually snow and ice disappear down here by noon of the day they arrive. The remnants of our couple of inches of sleet did vanish in a few hours late Friday night, January 31, when some warm air showed up and ran the temperature up to 52F and melted everything above water level. On February 1 there was still some ice by our dock, in the gut (top of post picture), and by our neighborhood’s boardwalk. Fortunately our driveways and palm trees were ice free. It seemed like by the end of January we would finally thaw out and get back on track for a normal winter. That was not to be. Once again the colder than normal weather came back with vengeance. There was certainly no declaring spring is here at the end of February like I did on February 28, 2011, or talking about March warmth like I did in 2009. The below average temperatures have been with us except for a few rare days all the way through February. About all we could do is dream about walking on the Point and capture whatever warmth we can find in some nice sunsets that we hope signal the end of winter. It is easy to conclude that the first couple of months of 2014 have brought us unusual weather. This year we got no warm January weekend like January 2013 and other years delivered much less our typical February warmth when the sun usually starts making a huge difference to all of us in North Carolina. Whether we will be hiking on the Point at Emerald Isle by March 16 like the folks in this picture from last year is an open question at this point in March 2014. As I write this in early March, the not so nice weather is still here. On the evening of March 6 and through the morning of March 7 when I am writing this, we have endured a pretty good blow with winds in the 20-30 MPH range. We also got 1.75 inches of horizontal rain during the night and it looks like it will not be over for another twelve hours. 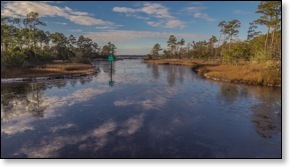 The water temperature at the bridge in Swansboro was at 53F on March 11, 2013. Surprisingly after all our cold weather, we were close to that at 51F in the river this year on March 3, 2014. 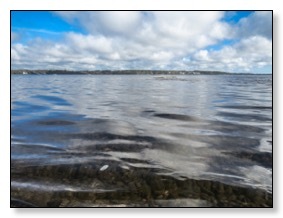 However, the bottom as fallen out of the water temperatures as we head towards the end of the first week in March 2014. It will be quite a while before we can really enjoy the river. It seems like forever since I paddled my kayak out on the river and got to float on top of my favorite oyster beds. I am encouraged that the forecast does look better for the second week of March and that at least our otters have not given up on the area and we are starting see our big birds come back after the cold chased them away. I really love the great egrets and other big birds that frequent our marsh. With that in mind I have started speculating as to when I will get to do my first kayaking trip of the year. I can hardly wait to be out on the river and and gaze at those glassy waters and always intriguing oyster rocks. Kayaking, boating, and fishing are just some of the many things which we start thinking about on the Crystal Coast when March rolls around. Another thing that is always on my mind is when we will see our first strawberries of the year. It is too early to tell yet, but I am will to be we will see some around the middle of April. If my stories has tweaked your interest, please check out our new $3.99 Kindle book, “A Week At the Beach - The 2013 Emerald Isle Travel Guide.” I can guarantee you will not find any ice on the water here in July unless it is in the cooler of a boat. 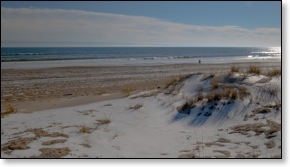 This winter will just be a memory when we start getting those perfect beach days that visit us many times during the summer season here near Emerald Isle. Perhaps your interest in our coastal paradise is more than taking a vacation in our area. If that is the case, I recently put together a collection of posts from the last few years. In them I talk about why we live here and some of the experiences that we have enjoyed. I will be adding to them as time permits. Many locals will tell you that there is no better way to see the area than through my eyes and the lenses of my cameras. If you would like to see some of those pictures of the spectacular scenery in our area, check out our just published $2.99 Kindle book, 100 Pictures, 1000 Words, A Crystal Coast Year. It is worth clicking on the link just to see the free sample of seven pictures. I picked the best 100 pictures from the over 40,000 that I took last year. Kindle reader software works on just about every platform including iPads and iPhones. If you would like to subscribe to my monthly Crystal Coast newsletter, just scroll to the bottom of any 2014 post on my Crystal Coast Life blog and register. If thinking about heading to the beaches with winter still on your mind does not excite you, perhaps planning a visit to the Canadian Maritimes in the heat of an American summer might. If you need a little Maritime travel advice to get your wheels turning, you will find it in our A Taste for the Wild book. We lived in the Maritimes for sixteen years and still have a fond spot in our hearts for the area. Nova Scotia is a paradise of blue and green and as long as you are not planning a dip in the water or a trip by boat. I was never able to find a spot as calm as Bogue Sound can be. However, you will find little to complain about in a place where Americans, even those of us from the South, are most welcome. I like to say the book is worth the $2.99 just for the story about our honeymoon on the barrens of Newfoundland where my wife was convinced that we were close to being lost forever. Our only book not available in paper back is 100 Pictures, 1000 Words, A Crystal Coast Year. Because of the high quality color photography, it would be too expensive in a print version. All of our other books are now available in print from Amazon. If you are interested in more information about me, check out the about me section of my main website. It has links to many other places where my writing is posted. You can also visit this site to see what I have recently published, or if you are interested in the technology side of the world, visit this list of articles that I have written for ReadWrite Web or if you care to see my thoughts on the latest issue that compels me to start typing visit my View from the Mountain site where I have been writing since 2004. More general information about the mainland where I live is available at this link to my Swansboro to Cape Carteret area page. You will find some helpful area details that might make folks think you are a local, but for the real local experience and information head for our travel guide. While no place is perfect, the Crystal Coast presents us with many options besides beaches that make life here very appealing. Living by the water is not for everyone, but we really enjoy everything from waves on the beach to the warmth of an evening on the beach or even the power of the ocean you feel standing in the surf. The magic of the river or our other waters is never far away. Sometimes the big water calls and other times I get seduced by the river and the fog. There are few places where you can have such wonderful November days on the beach. In the summer there are times when the heat will not seem to go away but there are ways to deal with the heat or humidity and even escape our paltry crowds. We typically have plenty of summer weather, but we do have four seasons here including some cold weather every few years. That just makes the other three seasons besides winter seem even nicer. To make life even better here on the coast, I would recommend a visit to our wonderful church home at Cape Carteret Presbyterian Church. We love to have visitors especially during our monthly fellowship luncheons. 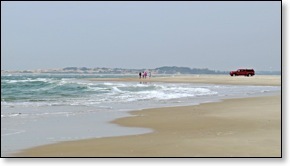 Our quiet spot sheltered by Bogue Banks, the Croatan National Forest, and the Cape Lookout National Seashore is a very friendly and scenic area with a great future. Right now it is the spot for us and sometimes I think I am living in a time and place that cannot survive the pressures of the modern world forever. I am just happy to be here now and able to share it with my children and grandchild.